Considering I was only in Paris for five nights, I was incredibly lucky not just for the number of sunny days I had in the midst of winter but for the fantastic quality of that light. This photo is an example of just how powerful that light was. And of course, I’ve said many times over that Paris was unbelievably photogenic. Probably the most intrinsically beautiful city I’ve seen. After leaving Notre Dame, I was heading for another famous landmark, the Eiffel tower. But as I did most days in Paris, I took the long way by foot along the Seine. And as I reached the Pont Neuf, I was rewarded for that decision. I looked across that old bridge, the oldest in Paris, and this is what I saw, a gorgeous old building absolutely bathed in a golden glow. I love the contrast in this picture, the cool blue shaded foreground of the Pont Neuf versus the light filled streets and the fantastic sky on the other side. There’s almost a mystical sense of transition here, like seeing into another world, a veil torn asunder. 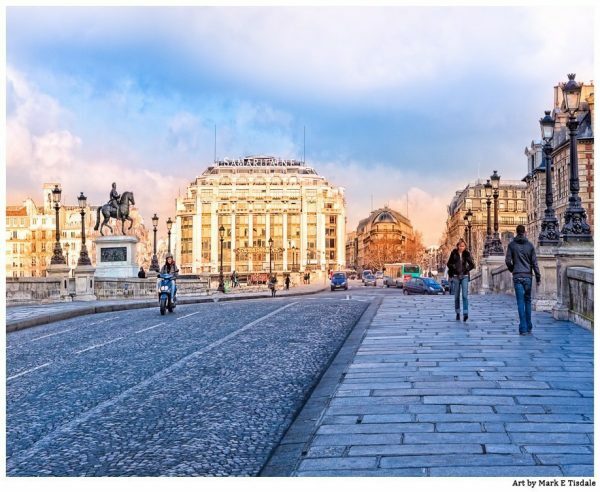 It was not until I got home that I would learn more about the history of the grand old building that features so prominently in the Parisian street scene pictured. La Samaritaine was an historic department store. It was in business over a century when it closed its doors in 2005. Originally built in the Art Nouveau style it was remodeled such that it’s a mixture of both Art Nouvea and Art Deco architecture. That dimension, that we’re essentially looking at a piece of Paris’ past, made this feel even more like I was looking at a little golden slice from days now gone, a golden age.